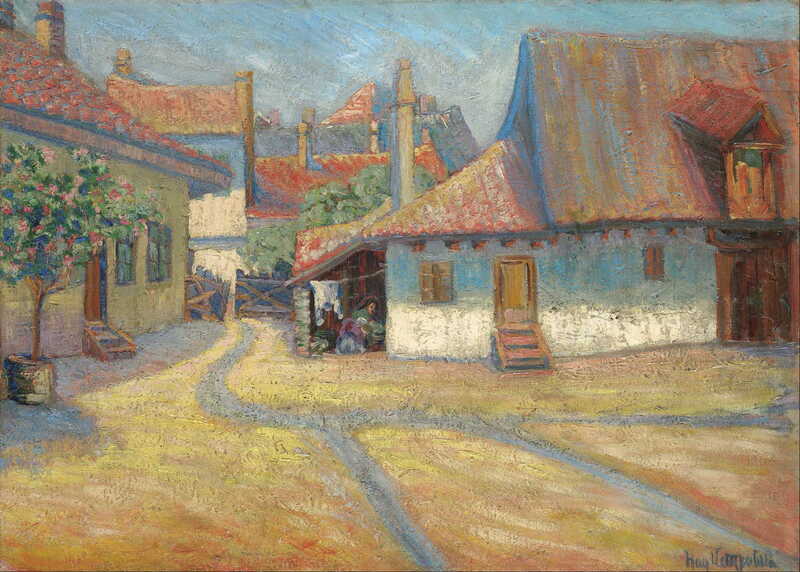 Nadežda Petrović, Belgrade Suburb (1908), oil on canvas, 65.3 x 90.7 cm, Pavle Beljanski Memorial Collection, Novi Sad. Wikimedia Commons. Between 1880 and the outbreak of war in Europe in 1914, many hundred artists must have either been trained in Paris academies, or developed their own impressionist style. You will find their paintings in their national and regional galleries, in most of the countries around the world. Sadly very few of them are accessible in books and the Internet. Where they are, there is usually too little information to support coverage in this series. However a few stand out, and there are one or two good images of their work available. I therefore offer the following short selection of those, to illustrate how broad was the influence of Impressionism. I apologise if your favourite painter or nation is not represented: if you do know of anyone who painted in impressionist style before 1914, and for whom there are at least 5 good quality images available without copyright problems, please contact me and I will be only too happy to try to post an additional article for this series. The next article in this series will consider what makes a painting Impressionist, before I try to pull together information from the previous articles and make some sense out of it. 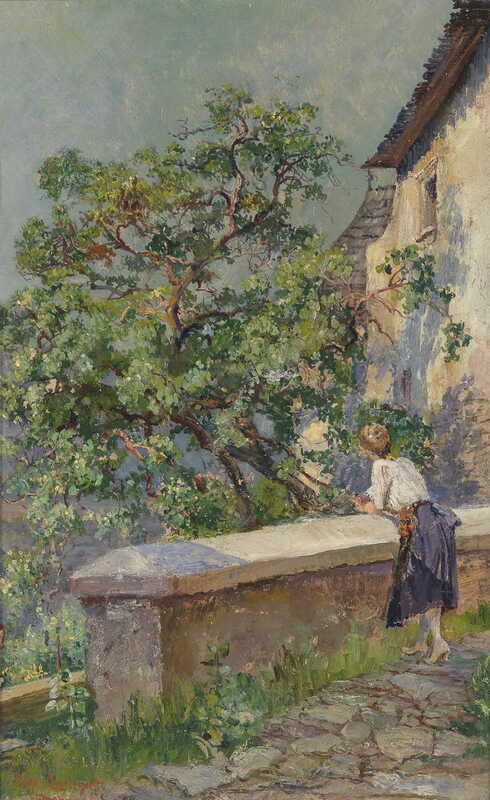 Hugo Charlemont, In the Wachau (date not known), oil on cardboard, 43 x 27 cm, Private collection. Wikimedia Commons. Born into a family of painters, he studied art at the Academy in Vienna, and painted in impressionist style. Nazmi Ziya Güran, Lady in Pink on a Chaise Longue (1904), oil on canvas, 54 x 73 cm, Sakıp Sabancı Museum, Turkey. Wikimedia Commons. Born in Istanbul, he studied at its Academy of Fine Arts, and met Paul Signac when he was sailing in the Mediterranean. He attended the Académie Julian in Paris from 1908, then worked in the ateliers of Baschet and Royer. He gained a place at the École des Beaux-Arts in Paris, where he studied under Cormon. He returned to Turkey via Germany and Austria, settling in İzmir, where he painted in impressionist style and ran a private art school. 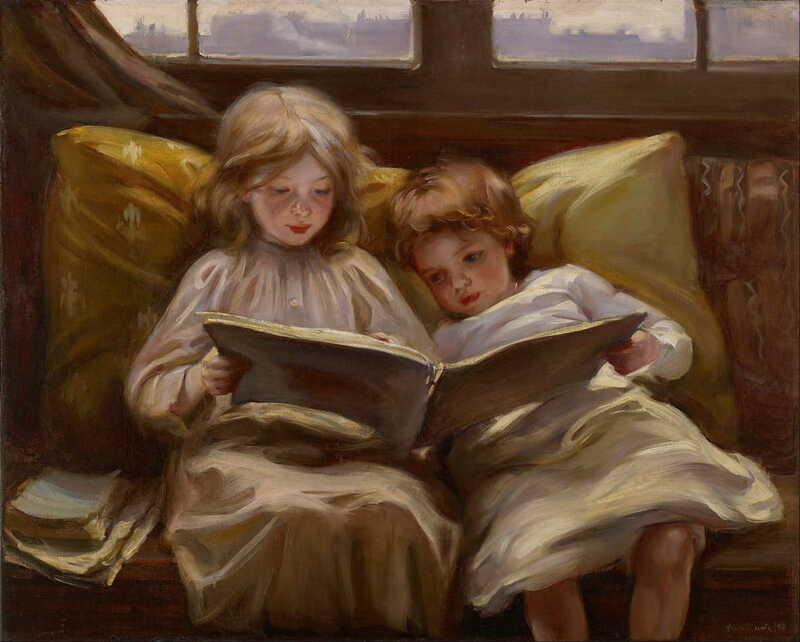 Laura Muntz Lyall, Interesting Story (1898), oil on canvas, 81.3 x 100.3 cm, Art Gallery of Ontario, Toronto. Wikimedia Commons. Born in Warwickshire, England, she emigrated to Canada as a child. She took classes at the Ontario School of Art and the South Kensington School of Art (London), before moving to France to study for seven years. There she studied at the Académie Colarossi. She returned to Canada in 1898, setting up her studio in Toronto, but moved to Montreal later. Her work was widely exhibited at expositions and exhibitions in the USA, Canada, and in France. She painted in impressionist style. 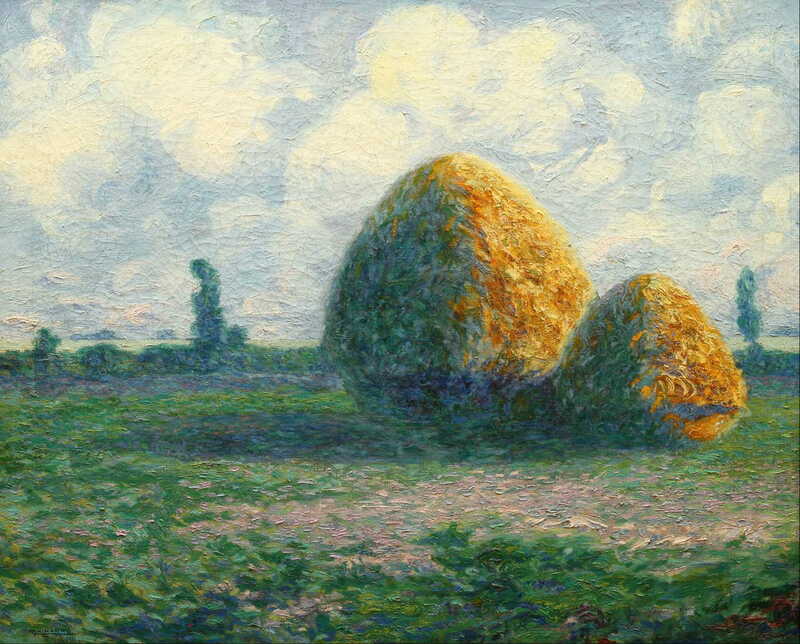 Martín Malharro, Grainstacks (Las Parvas, la pampa de hoy) (1911), oil on canvas, 65.5 x 82 cm, National Museum of Fine Arts in Buenos Aires, Argentina. Wikimedia Commons. Born in Azul, he went to Buenos Aires in 1879, where he was trained by local artists. In 1887 he became artist-in-residence on a ranch in Córdoba Province, where he developed his landscape technique. Growing success enabled him to travel to Paris in 1895. He returned to Buenos Aires in 1901, and popularised Impressionism. He was Dean of the School of Art of the University of La Plata, and a leading post-Impressionist. 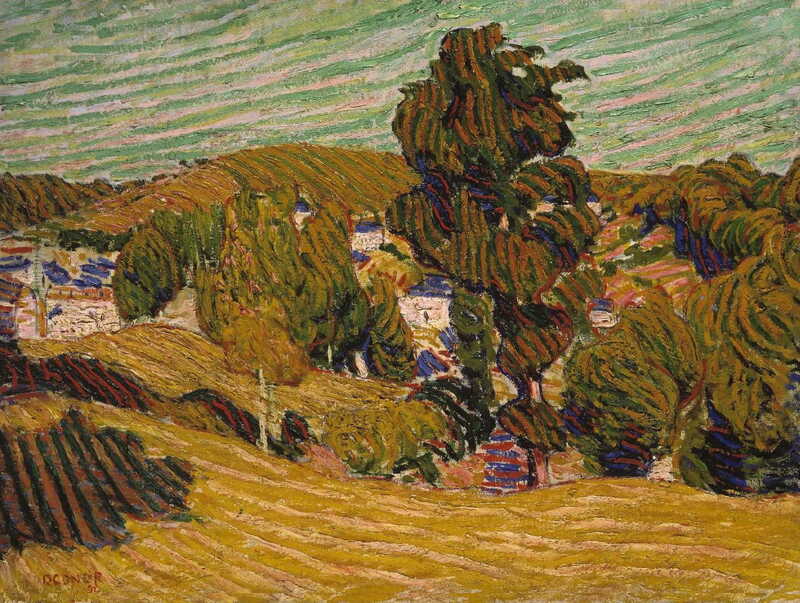 Roderic O’Conor, Yellow Landscape (1892), oil on canvas, 67.6 x 91.8 cm, The Tate Gallery, London. Wikimedia Commons. Born in County Roscommon, Ireland, he attended the Royal Hibernian Academy, then went to Antwerp. 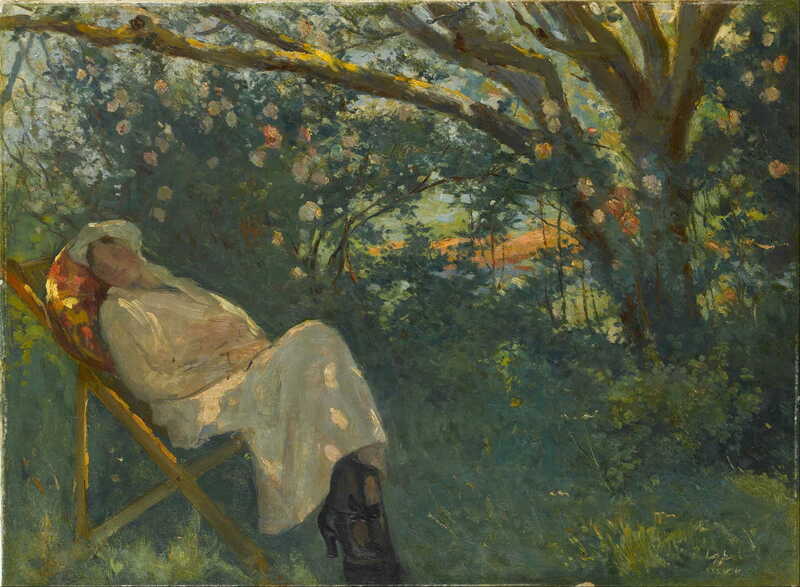 He went on to Paris, and in 1892 lived and painted in the artists’ colony at Pont-Aven in Brittany. He befriended Paul Gauguin, but most frequently painted using textured strokes of contrasting colour, more like the style of Vincent van Gogh. Born in Čačak, she moved to Belgrade where she started her artistic training. She studied in Munich, and in the first decade of the twentieth century her paintings were widely exhibited in Europe. In 1912 she volunteered as a nurse in the Balkan Wars, then the First World War. She was decorated for her bravery, and admitted to the Order of the Red Cross. She died of typhus during the latter war. Władysław Podkowiński, Lily of the Valley (1892), oil on canvas, 141 x 90 cm, National Museum, Kraków. Wikimedia Commons. Born in Warsaw, he studied at the Academy of Fine Arts there from 1880-4, then at the Imperial Academy of Arts in St Petersburg in 1885-6. He went to Paris in 1889, where he acquired his Impressionist style. In 1894 he slashed one of his own paintings on the final day of its exhibition. In his later years he became more of a Symbolist, but he died young of tuberculosis. 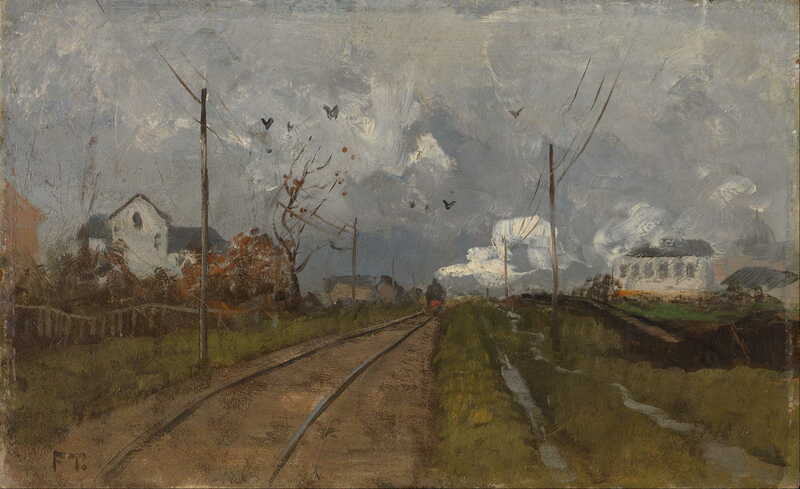 Frits Thaulow, The Train is Arriving (1881), oil on canvas, 14.5 x 24 cm, National Gallery (Norway), Oslo. Wikimedia Commons. Born in Oslo (then known as Christiania), he was trained at the Academy of Art in Copenhagen, then at the Baden School of Art in Karlsruhe, Germany. He painted with the Skagen group in Denmark in 1879, returning to Norway the following year, and painting in impressionist style. He moved to France in 1892. 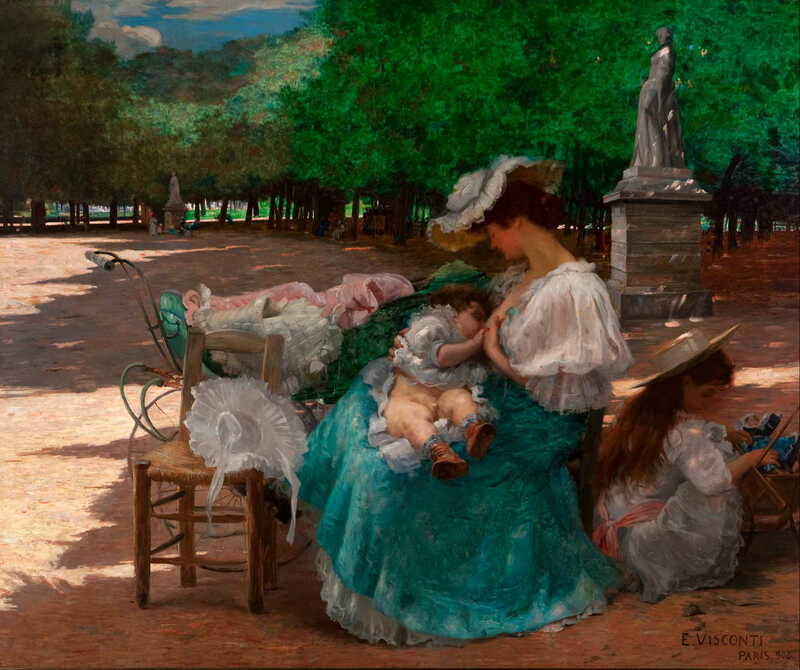 Eliseu Visconti, Maternity (1906), oil on canvas, 165 x 200 cm, Pinacoteca do Estado de São Paulo, São Paulo, Brazil. Halley Pacheco de Oliveira derivative work: Jbarta, via Wikimedia Commons. Born in the Campania region of south-west Italy, he emigrated to Brazil. He studied at the Liceu de Artes e Ofícios do Rio de Janeiro and the Academia Imperial de Belas Artes, receiving the latter’s gold medal in 1888. He travelled to Paris, where he attended the École des Beaux-Arts from 1893, and took classes at the Académie Julian and the École des Arts Decoratifs. He was awarded a silver medal at the Universal Exposition in Paris in 1900, and exhibited at the Paris salon in 1905. He was appointed professor of painting at the Escola Nacional de Belas Artes in 1906. He painted in impressionist style, then Art Nouveau. Posted in Painting and tagged Charlemont, Güran, Impressionism, Lyall, Malharro, O'Conor, painting, Petrović, Podkowiński, Thaulow, Visconti. Bookmark the permalink.